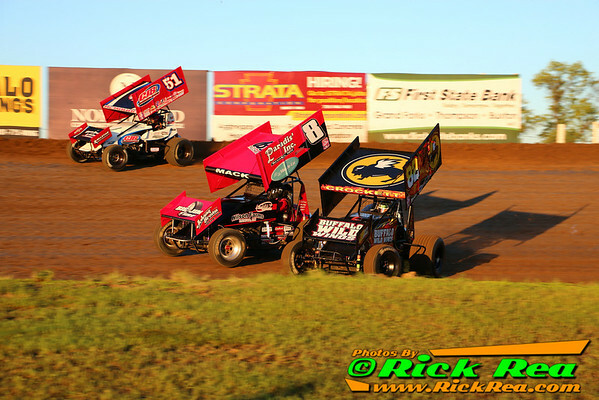 On Friday, the World of Outlaw STP Sprint Car Series makes their second and final return to River Cities Speedway in Grand Forks, ND. During their first visit on June 20th, Donny Schatz passed Cody Darrah with two circuits remaining to claim his second consecutive World of Outlaw victory at RCS. Friday promises to be an exciting and story-filled night as the newly crowned FVP Knoxville Nationals champion, Schatz, shoots for three-in-a-row at RCS while hometown driver, Mark Dobmeier, has one last chance this season to pick up that elusive WoO win and the 20-time WoO champion, Steve Kinser, competes in his final race at the Bullring. Saturday night will also be an action packed night of racing as a NOSA Sprint Car/NLRA Late Model show is on tap (if Friday's World of Outlaw show runs as scheduled. If not, Saturday night will be used as the rain-date). With the World of Outlaws racing the night before, you never know what out of town, big named drivers will stick around to try to tackle the Bullring again on Saturday night. On Sunday, the "Greatest Show On Dirt" heads west on Highway 2 to Nodak Speedway in Minot, ND.